How do people search for it (what keywords)? Google among others, provides us with a long list of tools that help us understand the search habits people have while making searches on the Internet. 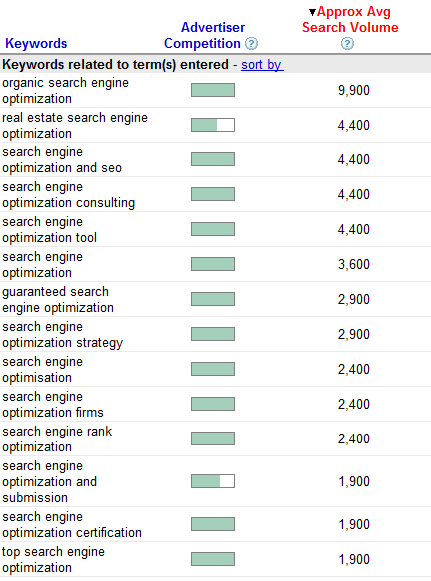 Below is the image from the Google Keyword Tool showing the list of the Keywords related to the search phrase: Search Engine Optimisation, sorted by the Search Volume. Understanding the reasons behind the search phrase popularity is the key step towards mastering the search engine optimisation and optimising your web site for the search engines. A clear winner here. Organic is the word that defines the natural search results, as opposed to the ‘artificially’ placed search results that the search engines used to place within the natural results and charge for that placement. Today the word Organic specifies that the site is ranked naturally as opposed via some search engine marketing channel like Google AdWords. Perhaps specific to the Irish online marketing and the times where we live in today. House prices have been growing rapidly for the last 10 years, and a year ago after the peak, the prices are gradually falling down. Naturally real estate agents are hectic in the way how to advertise, hence the enormous amount of the searches for the real estate SEO. Not really sure what to look for? Is it SEO? Is it Search Engine Optimisation? Well a lot of people is betting putting the full name and the abbreviation will do the trick. The word Consulting tells us a lot about how people see the SEO function in their organisation. It definitely is a Consultant people are looking for. Someone external, someone hired per project, someone with skills, someone that will cost ya…. DIY approach. And why not! Ireland is renowned for its entrepreneurs. Let’s get some Tools and do it all yourself. There are excellent tools out there. Google gives you a whole plethora of titles you can use for SEO. Notice that the volume of the searches for the Organic search engine optimization is three times bigger than the search engine optimization itself!? I certainly find it hard to believe. Then again, in SEO, not that many things are that believable anyway. Right! You have been burned, and it will not happen again! Now you want guarantees. No more wishy washy stuff. You are ready to sign a contract with a BIG budget, and want to have it specified in the contract that next month your site will be first in Google for all your keywords. All thousand of them! Guaranteed! ‘SEO for Beginners’. We all know that is if you do not have the best strategy and the best plan, you will never achieve good search engine ranking results. So let’s get ready. Let’s get our strategy right. Here comes the proper Irish spelling of the Optimisation. Or English actually. SERO? Actually that would be as incorrect as the current abbreviation SEO used for the search engine optimisation. We all know that it should be Web Site Optimisation – for the search engines. Submission! Back to the ’90-ies, where the Web was full of the countless Web Site Directories, where one was supposed to list your site. Today almost all the searches start in Google. You even buy a new PC’s with Google Search preinstalled within the operating system. And this is where you should list your sites – into the desktops of the PC’s. Right. We have tried this and that. We hired a SEO guy, we got the SEO Consultants from the outside. None of them changed absolutely anything. Now we are looking for some Certification here. Some credentials. And funnily enough it is not like a search for a needle in a hay stack it is just a missed shot. There is no such thing as SEO Certification (not to be mistaken with the Google’s SEM Certification!). Have you hired the SEO guys who have done good work, but your competitor just hired even better SEO guys who have done even better job? This time we are shooting straight to the TOP! Right,… so that search engine optimisation strategy from above obviously didn’t work. A lateral movements here, and we need to consider a number of different approaches? Well no, we did not fail with our original SEO strategy, we just need to revise and modernise it a bit perhaps? Understanding how and why people search the web the way they do is crucial. Analyse the top (most used – largest volume of searches made)search phrases around your main ones, to understand your potential visitors better. Use that knowledge to lure them to your web site by optimising it for the most popular search phrases.